We saw several games built around Champion Mastery each with its own merits, but our favorite was Mastery Duel. Utilizing Champion Mastery, this card game allows players to experience their favorite champions in an entirely new experience that made the game feel way more personalized than we’ve seen in the past. The combination of the scope of the project, the game play, and integration of Champion Mastery that lead us to choose Mastery Duel as the winner in the entertainment category. There were a lot of entries that took a snapshot of a player’s Champion Mastery, but we felt Mastery Profiler rose above the rest because of their approach. 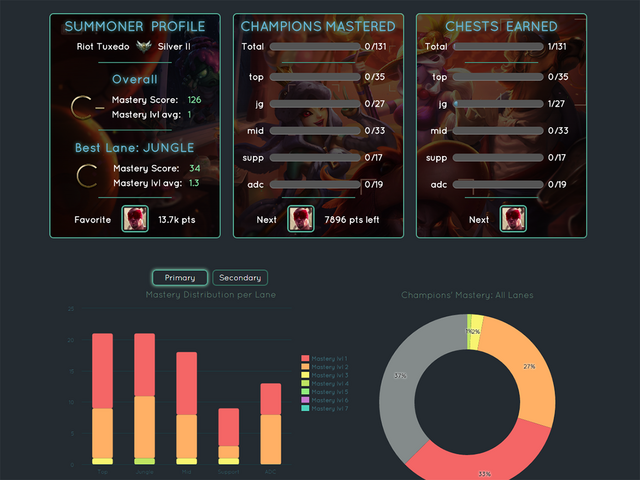 Mastery Profiler covered all the bases with a quick statistical overview, a graphical breakdown by lane, and a way to search and sort through your own mastered champions. Many of the entries in this category took their own unique approach to grouping Champion Mastery data, and for Mastery Profiler grouping Champion Mastery by lane paid off. Grouping by lane put the data in a context that felt more relevant to the user. We chose Master Profile as the winner in this category because of a clear and easy to digest presentation which we believe will be the most usable/practical for players. 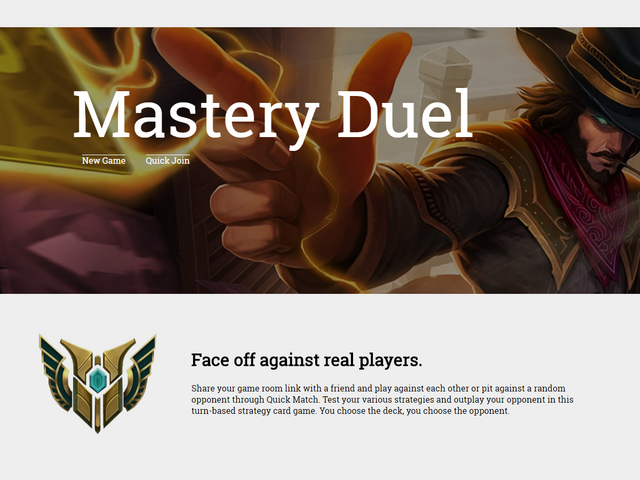 LeagueMastery’s goal was to give players more thought in every step they take by providing players with a view of each team’s champions with a link to tips on how to play their lanes. Executing this in a useful and player-focused manner is why we chose LeagueMastery as a runner-up. In the contest announcement we described how we were looking for entries that focused on a new way to visualize Champion Mastery data. 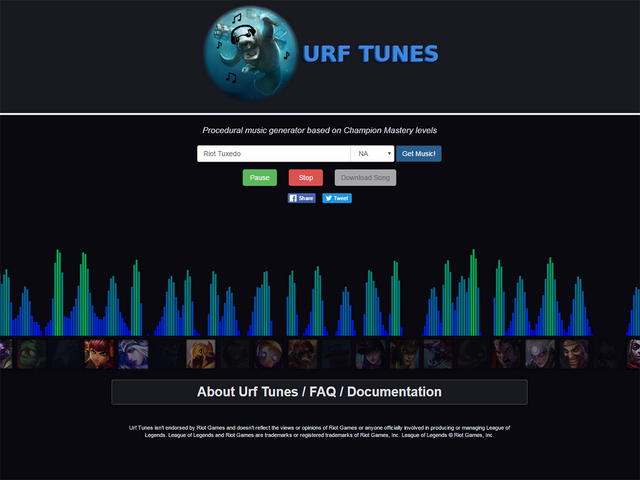 URF Tunes started with the premise that each player’s mastered champions created a unique fingerprint. A musical representation of this fingerprint has a lot of potential hurdles and URF Tunes nailed it. Players can now enjoy their own personalized song and explore the tunes generated for each of their friends. The unique approach, the technical hurdles, and the seemingly flawless execution is why we chose URF Tunes are the winner in the creative/original category. Gromp provided an overview of a player’s mastered champions, but specifically what caught our eye was the integration of the achievements feature. This was a great approach to Champion Mastery and provides a cool social aspect. RoadToMastery did an analysis gathered from platinum+ players which we saw some several entries, but what we found unique about this entry was its comparison of the performance between various levels of Champion Mastery and the ability to compare your own performance. © 2018 Riot Games, Inc. All rights reserved. League of Legends and Riot Games are trademarks, service marks, and registered trademarks of Riot Games, Inc.